“Straight out the dungeons of rap…..” Grand Official stands firm within all elements of hip hop. Established back in 2003, they’ve taken a patient approach to the creative process. With mad respect for the art form, Grand Official is not trying to reinvent the wheel, they’re simply constructing a genuine feel based on dope beats, dope rhymes, and dope cuts. The crew consists of two producers (GRIP & AONE) who understand that hip hop beats should be raw and full of drums that kick off a timeless memory. Then there’s DJ HALUCIN-8 ripping needles on vinyl. 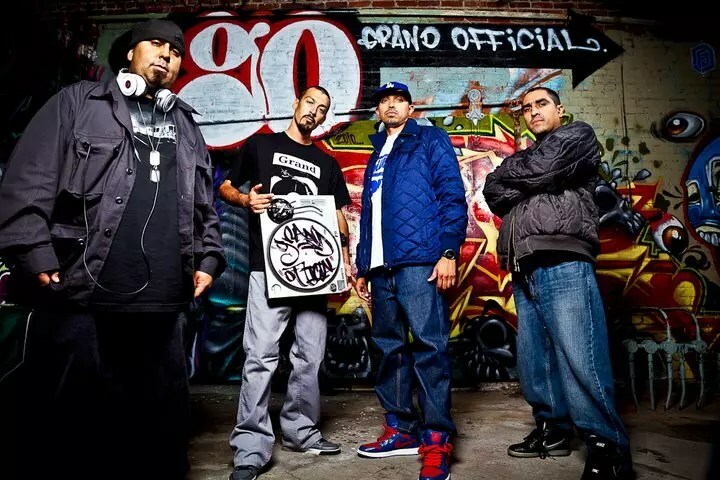 Listening to Grand Official you will notice that the emphasis on the turntablist is not only important and necessary, it’s the very structure that elevates the entire experience of both their live show and their records. No hip hop moment should go without rhythmical wordplay. Grand Official also takes on the presence of MC’s ADOSE & ADLIFE. Together and individually, they stand up to beats with rhymes that describe their lives, their perspectives, and their passion for true verbal skills. Grand Official is a promise to never forget what dope hip hop is. They represent the freedom to do what you believe in. They are the hard work, the selflessness of artistry, the voices, the faces, the touch, and the spirit of hip hop. Proof that real hip hop can still grow from the trenches and from the roots of Los Angeles.